I love hands on learning and am all about science experiments where the kids can have fun while actually learning something. We’ve grown crystals, soaked eggs in vinegar, and frozen just about every substance you can imagine. I actively encourage the kids to participate in these experiences, and love that they love to find experiments in the world around us. That’s why the kids were in a Montessori environment and why we continue to do the virtual school program that we do. But…..it appears that we have created a monster. The giggle monster is now seeing every item---every piece of furniture, every liquid or goo---as a potential science experiment. Let me share a few with you. First, there was the experiment to see if matchbox cars can drive down the wall. Honestly, I was a little amused by this one, and semi-hopeful that track marks would deter my husband from noticing that I accidentally over-sprayed the Lysol when I was cleaning light switches—fun fact for you: Lysol removes paint, who knew? Then, there was the painting experiment to see how many layers of paint and water it takes to soak through a piece of paper. A little messy, but it was on the kitchen counter so not too bad to clean up. This was followed by the experiment to see what happens if you mix paint, water, and glue….in one of my good glasses. Alright, not a huge problem, we have plenty of glasses so we can afford to lose one in the name of science. The how-many-objects-does-it-take-to-flood-the-sink day of experiments was interesting. Seriously, though, my bathroom floors probably needed a good scrubbing, and everyone knows you don’t really get them clean until you have repeated the exercise a few dozen times. Next up was the experiment to paint his walls and matchbox car tracks with glue. I walked in his bedroom to the tune of “don’t touch the walls mommy, the glue’s still wet.” Let’s not forget the Angry Birdx squish’em covered in glue and then wrapped in paper. This experiment went awry, though, when he couldn’t remove the paper again. In the name of science, however, I learned that S.O.S pads, hot water, and dish soap will clean up a squish’em quite nicely. About this time the experiments expanded to include aerodynamics. Would you like to know what items fly when they hit the ceiling fan? How about the giggle monster’s own attempts to fly off of everything, which thus far has included the couch, the bar stools, and the kitchen counter? Lest we not forget he also used the dining room table as a stop in his obstacle course “‘periment” which yielded a flipped over table today. Yep, read that right, the entire table flipped over. Back to the glue---we seem to have had an experiment today that involved water, glue, and glitter. Who knew such a combo could be so bright and sparkly, especially when it is spilled all over your family room carpet. There was also a plunger experiment. I am not entirely sure what this one involved because I hadn’t had enough caffeine in the day to hand the plunger over when he asked. I do know, though, that the right combo of items in the toilet with enough frequent and rapid flushing will create a “waterfall” in your bathroom. I don’t have the energy to relive the bubble episode from a few weeks ago, but trust me the darn things aren’t as harmless as you might have thought. Oh, and I’ve got a few Playdoh horror stories, but this close to the holidays when you probably have your shopping done, I just won’t ruin those moments for you. I want to be annoyed, really I do. Seriously, I do have things to do other than clean up, clean up some more, and then clean up again. But we spent so many years focused on “creative play” and wondering if he would ever be able to play in a fun and spontaneous manner that if I am totally honest his “periments” make me chuckle. Granted, I’d like to have enough time in the morning to get my caffeine drip started before he provides me with the opportunity to learn a new clean up skill. And honestly, the glue and glitter need to go up some place really, really, high. But as long as he doesn’t hurt himself, doesn’t destroy too much of our house, and has fun, then I’m just going to assume that he’s learning something in the process of creating science experiments. 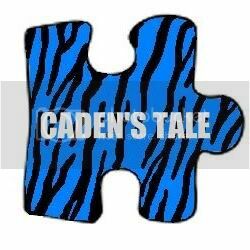 If nothing else, he is learning that sometimes life is just a little messy on the path to Caden’s Tale. That’s less time than it took me to earn a PhD, which acknowledged a certain level of expertise in my subject field. That’s considerably more time than it took me to fall in love with my husband and know that he truly was/is my soul mate. It’s been five years since we were officially given Caden’s autism diagnosis. You’d think I’d be able to claim expertise or know something for certain about autism in that time period. Yet, looking back, I’d have to say that for every ten great ideas that we have had about therapy techniques or therapy items or autism management strategies, only one or so has really ever been successful. On one hand, I can relive that day as though it just happened; I can feel my heart racing, my stomach drop, and anxiety rush in over wondering where we would find services, how we would pay for them, and what the future really looked like. On the other hand, that moment seems like a distant blur lost in the day to day challenges, struggles, and rewards that living a special needs life means. There are some amazing contrasting moments to consider. The first summer after Caden’s diagnosis he developed a phobia of bathing torture boxes otherwise known as bathtubs. We worked hours on end in therapy to try to conquer this fear, while also letting him play in the garden hose in the backyard because that was “safe” water in his world. By midsummer we were even taking baby soap out to squirt on him while he played. (And we wonder why the neighbors offered to help us pack when we sold our house.) And yet this week he passed the next swimming level at the Y in record time. We bought every “potty” chair, seat, stool, and book on the market to absolutely no avail. Yet the summer that Caden decided that he “got it” he was potty trained in one day and has never had another accident again. He went from nonverbal to verbal to nonverbal back to verbal again. I think we have language now, but articulation and receptive language remain huge challenges. We tread lightly though because when language becomes too hard or too embarrassing or too much, he easily gives it up. I can’t even criticize him for that because my heart can only begin to imagine what a struggle this is for him each and every day. Who knew that the ABCs would remain an IEP goal for so many years but that we would know in a matter of minutes that ABA wasn’t the right therapy method for Caden or our family? When you add in OT/PT/SLP and CBT, it starts to become apparent that we have all learned a new language on the road that is autism. I’ve bit my tongue more times than I care to count to avoid getting into vaccine debates or discussions over whether or not the desire for a cure means that you don’t love and accept your child. I’ve lost sleep wondering if the decisions we are making are the right ones, and even more sleep when Caden proves that we don’t have the slightest understanding of his autism despite of our best efforts. I’ve researched until it feels like I can’t absorb another fact, and then started all over again when it comes to fruition that I was on the wrong trail. I’ve wrestled with medication decisions while trying to weigh if my objections are in Caden’s best interest or purely my own desires. I’ve defended our decisions to enroll him in Project Lifesaver because I know the day is when, not if, we need help finding him in a busy mall or a crowded park. I’ve thanked Elf, the super service doggy angel, more times than I can count for doing his job and more importantly being “the bestest friend” Caden could ever have. If there’s one thing that I wish I would have known 5 years ago, it’s that autism would grow and change along with Caden. The goals aren’t check lists to be met, but ever evolving dynamics to figure out. I guess by now I’ve figured out that I probably won’t ever figure things out but I can also say with certainty that I’m more okay with that now. I’ve stopped trying to solve future problems now and have started focusing on the moment. Sometimes those moments are funny, sometimes they are heartbreaking but they are always a part of Caden’s tale and honestly I can’t imagine being anywhere else. In the spring after sitting through several hours of a dance recital, Caden remarked that he could cry because the dancing was so beautiful. At the start of a football game, Caden asked when the singing of the Star Spangled Banner would be over. When asked why, he replied that the song made him cry. While his sister was getting drops in her ear for a painful case of shingles, Caden ran from the room and asked us to let him know when we were done. Crying while watching a commercial for an agency who works with abandoned and abused animals, Caden wanted to know if we could go get them and bring them home so they weren’t sad anymore. If you would have asked me several years ago when we were still new to autism, I would have remarked that Caden lacked empathy as evidenced by the fact he didn’t really seem to notice if you were laughing or crying, even if you were sitting next to him. I would have probably also said that he didn’t really seem to notice what was going on around him nor did he particularly care. I would have also stated that he was obsessed with his fixations, whether it is stacking blocks or lining up cars. And I would have been totally and completely wrong about it all. Looking back now, I couldn’t have misunderstood, misrepresented, or completely missed more about my son. To be honest, that isn’t easy nor is it pleasant to admit. See, at the time, I thought that we needed to work more on emotional recognition because he didn’t get it. I thought we needed to work on helping him become more aware of the world around him because he wasn’t noticing it on his own. I thought things like eye contact and new interests were the most important goals that existed. And like I said, I was wrong. What we have come to realize is that Caden doesn’t lack empathy. Instead, he is overly empathetic to the point that others’ emotions are overwhelming for him. Some are even painful for him to the point that he often cries at bedtime in his attempt to deal with all that he has encountered throughout the day, either as a participant, a bystander, or maybe just a television viewer or song listener. He doesn’t yet have the social skills or the vocabulary to navigate all that he is feeling and experiencing. His fight or flight response is to either flee by physically leaving the interaction, or when that isn’t possible he finds comfort in the familiar routine of lining, stacking, or spinning that gives his mind an escape that his body can’t quite make. When he isn’t able to escape physically or mentally the emotions crash over him in an experience that leaves him with tears. His sobs aren’t that of an un-empathetic child, but one who has taken in more than he can process in that moment. The same memory that allows him to script entire episodes of his favorite television shows is the same memory that also forces him to relive all of those encounters over and over again. Studies have discussed the possibility that some individuals with autism avoid eye contact because the eyes are too intense, too emotional, too revealing. Maybe that explanation works for other autistic behaviors. Reading nonverbal communication, understanding inferences, figuring out non-literal language, and learning how to engage in social chit-chat are all still important goals for Caden. But at the moment, learning how to cope with the intense onslaught of emotions that occur in any day takes precedence. This emotional overload is the source of intense anxiety, and realistically is probably the explanation that we sought for years with regard to Caden’s sleep difficulties. As his vocabulary and ability to self-soothe continue to increase, I think his coping abilities will too. The goal now is to help him learn to cope and manage all that he is experiencing. I think we need to be careful in how we work toward that goal. I don’t want to do anything that damages or lessens his empathy because that is such a core element to whom he really is. It is such a core element to whom he will become. I’ve been really wrong in the past and I don’t want to make those mistakes again so the cues and direction on how to proceed have to come from Caden. For now though I am trying to see the world through his eyes, his ears, and his heart. When I actually slow my brain to the world around me, it is an amazingly intense place. Maybe the key to making a difference in human or animal suffering is to really notice that it is happening around you. Maybe the key to living a truly happy life as well is to be able to really notice the beauty in a song, in a bird, or in a moment. It is quite possible that my son at the tender age of 7 already knows more about living than I do. Caden pointed out to me the other day that every television show starts with a theme song so you can dance “’cause it is just fun.” So we have been dancing to every commercial and theme song we can this week and what do you know, he couldn’t be more right. Labor Day weekend I had visions of creating one last day of fun before Dan and I headed back to school and the kids got caught up in all of their fall activities. Instead I woke up in pain—a lot of pain actually. After realizing I really couldn’t walk because I had so much abdominal pain, I decided to head over to the ER. The worst case scenario was that I thought they would send me home with a diagnosis of a tummy ache and in best case scenario they would have something to dull the pain until my doctor was back in the office. I didn’t post anything on Facebook or even call my mom because I figured it would be as quick of a trip as you can get in the emergency room on a Sunday. Fast forward a few hours after some bloodwork, CTscan, and an ultrasound and Dan and I were sitting listening to the doctors explain that I had a fist-sized mass on my left ovary that they were convinced was cancerous. They were so convinced in fact that no one locally would operate, and they started to talk about chemo and radiation options. Once I was settled into my hospital room, another specialist came in to review the test results with us. By that point, I was getting IV narcotics every hour to control the pain so my mind wasn’t the clearest, but my fear was. I can say with absolute certainty that my fear was never really about me. I never had a thought over something I wish I had done or still planned to do. My fear was for my children; would they remember me, would they be able to stay together with Dan, how would they handle the mommy moments that are sure to come up in their lives? And to be honest my fear was overwhelming; so overwhelming that I ended up with a dose of happy medicine because I lost the ability to breathe. The happy medicine did its job, I guess. Before anyone asks, yes I did have a lovely conversation with the friendliest squirrel who was hanging out in my room and said squirrel may or may not have been pink. And yes I had some incredibly stupid drugged-Jennifer moments. I end up with a concussion from falling because I was determined I could go to the bathroom by myself. I got alarms put on my bed because I didn’t particularly like calling for help when I needed to get up, and I did my usual amount of apologizing to any and all staff. But nothing—hourly narcotics, pain pump, or pink squirrels--did anything to quell the fear and absolute sadness for my kids that I felt. I thought about how we would break the news to Ryley and what death fears it would bring up again for Caden. The next day I was being transferred to Mayo-Rochester because they have a gynecological cancer unit. Transport was backed up so I asked Dan to go home and get the kids so that I could see them before I left. In a stroke of bad luck, transport moved ahead of schedule and instead of having time to talk to the kids and visit with them, they walked in the same time as the paramedics. By this point, the kids knew my mother was flying in, and while Caden was just excited grandma was coming, Ryley knew that this was not just an ordinary stomach surgery. Now I had the guilt of leaving her without a proper conversation on top of the feelings I’ve already told you about. The first night at Mayo was one of the loneliest times of my life. Geographically I wasn’t all that far from home, but emotionally I was in a strange hospital surrounded by doctors and nurses I didn’t know without anyone with me. Insult to injury, due to an accidental drug overdose on the part of the transport staff I wasn’t able to call Dan nor was he able to get any information about me because I couldn’t give consent for staff to talk to him. Lonely and afraid doesn’t make the best combination in the world, but eventually I thought to ask the nurse to give me my little travel bag that the kids had packed for me and was able to enjoy my pillow pet from Ryley and lovely rocks from Caden. Tuesday morning my mom and Dan were able to come up to visit with me for a bit before surgery. Pre-op was surreal; for the first time ever I couldn’t answer who my doctor was when they asked because I really and truly didn’t know. I remember trying to plan how I would react to whatever news I received in recovery, and at the same time knew the reaction would just be whatever it was. I was lucky, very very lucky. Even though the mass was fist sized and they had to remove quite a bit of fluid along with the mass, it wasn’t cancer. What I find odd now, though, is that they stated it wasn’t cancer and then whispered “but you are in surgically induced instant menopause” all in the same breath, and somehow the menopause was made to sound worse. No further information was given, but the next day the doctor told me she would call in a hormone replacement therapy patch, and that if I had an troubles to call her and she would up the dose. A follow-up visit with my own doctor yielded pretty much the same hush-hush information. I’m confused by the taboo over menopause “at my age” but that’s another post for another day. Now I’m trying to recover, and I have to say my body is doing so much faster than my mind. My mind is still trying to comprehend how we went from a simple ER visit to the possibility of cancer, how a quick trip turned into a medical transport, and how the holiday ended up in the operating room. More than all of that is the disbelief that this huge, ugly, dangerous mass was growing inside of me and I didn’t know. And then there’s the lingering fear and pain; the drama is over and done with, but you don’t get to just forget those mommy thoughts. Mommy fears are the stuff nightmares are made of. They are the kind of thing that makes you re-examine every interaction you have with your children, ever have had, and ever will. It’s the kind of thing that makes you re-prioritize what quality time means and how precious every hug and kiss really is.